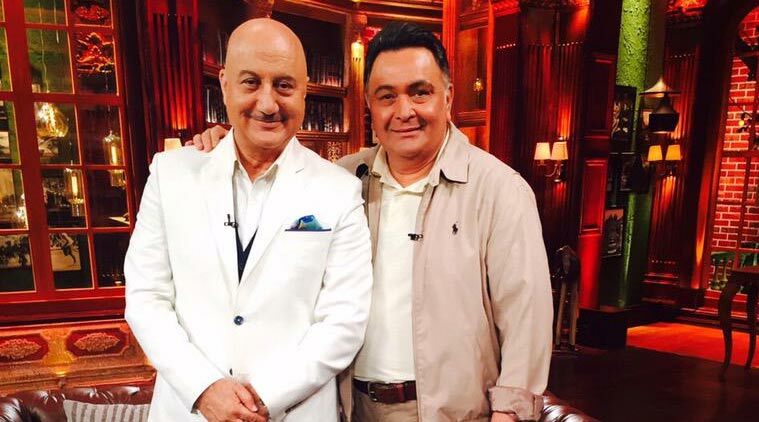 Veteran actor Rishi Kapoor will be seen in an episode of the second season of Anupam Kher‘s TV show “The Anupam Kher Show…Kucch Bhi Ho Sakta Hai”, and he has thanked his “great co-star” for inviting him. The 62-year-old actor took to his micro-blogging website Twitter to thank Anupam for inviting him. “Thank You Anupam for having me over on your show ‘Kucch Bhi Ho Sakta Hai’. You are a wonderful actor and a great co-star,” Rishi tweeted. Anupam made his TV production debut with the first season of the show last year on channel Colors. The show focuses on inspirational stories of popular Bollywood celebrities, who will speak about their challenges in life. Tinsel town’s famous names like Shah Rukh Khan, Mahesh Bhatt, Alia Bhatt, Om Puri, Naseeruddin Shah, Kangana Ranaut, Vidya Balan, Kapil Sharma, Yuvraj Singh and Akshay Kumar appeared as guests on the show in 2014.